Yes, you read that right. We have a car! Well, technically speaking we don't have a car yet, because so far we haven't picked it up. We did buy one, however. Or promised to buy one anyway, because so far money hasn't changed hands. But it will, very soon, and then we'll have a car. Once we pick it up, that is. You know what I mean. 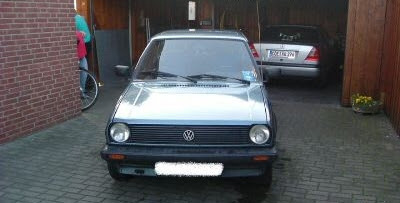 It's a 1988 VW Polo 86C Steilheck in blue metallic. 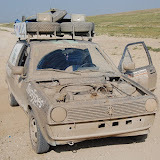 I never thought I'd buy a car off eBay, but then again I never thought I'd drive to Mongolia in a crapmobile and here we are. According to the small fuzzy pictures that we have and the description of the car on eBay, it might just be what we're looking for. So, why'd we pick a Polo? Well, for one thing we're "Ze Germans" so we figured we'd have to drive some good old-fashioned German Engineering. Once you've got your heart set on a German car, there aren't that many options with 1-litre engines and the Polo is the most obvious choice. This is particularly true if you don't want to go with a Corsa and I really didn't want to go with a Corsa. In addition the Steilheck version of the Polo has the advantage of having a pretty big boot, particularly after you've flipped the rear seats. Let's have a look at our particular Polo. On the pictures it looks to be in fairly good shape. Several parts were recently replaced, including the head gaskets which are apparently a major point of failure for the Polo. It has a CD Player! This thing is almost as well equipped as an S-Class. Apparently it has H4 lamps installed. I have no idea what that means and I'm too lazy to Google it, but it sounds great, so I'm listing it under "Good". The car comes with three doors. This is very useful. Even if two doors should fail, we'll still be able to get into the car. Maybe even out of it! It isn't white. I really wanted a white one, mostly because that would have been an excellent base for all the stickers. Still, at least it isn't silver. It doesn't have those cool double headlamps, that some models have. I really wanted those double headlamps. I guess we'll have to bolt some on by hand. Winter tires. July 21st isn't exactly in the middle of winter. Martin will pick the car up next week. Let's hope this is the one. If not, we'll just eBay it and get another one. I'm currently filling out our visa applications. As you can imagine, this is great fun. Nothing like ending your day with a healthy dose of Uzbek bureaucracy. Russia really takes the cake, though. Among other things you need a so-called "Hotel Voucher". This is apparently some sort of document from the hotel you're planning to stay at. Of course we're not really planning to stay at a hotel, so we don't have a voucher. No voucher, no visa. Lovely. Fortunately the market finds a way for these sort of problems, and you can purchase vouchers from Russian travel agencies, without actually booking a hotel. That'll be 50€, comrade. Another favorite of mine is Kazakhstan's request that you write down the exact date at which you plan to leave the country again and the specific border crossing where you intend to do so. How the hell should I know? I'm not even sure we'll make it this far at all! We'll probably have to do some creative guesstimating there. The whole thing isn't made easier by the fact that I still need my passport in May for another trip and that the embassies generally take their sweet time processing the visas. Naturally, you can expedite the process by paying extra. Applying for visas maybe a bit expensive and time-consuming, but you should really try it. It's fun for the whole family. I have started learning Russian. While gesticulating wildly and drawing stick figures in the dirt will probably be our primary means of communications on the rally, I thought it couldn't hurt to know some key phrases in Russian. Phrases like "Our car has broken down." and "Please you don't kill us!". You know, the basics. Yes, I'm afraid we're going to have to ask you for money. Don't panic. It's not for us, it's for a good cause. 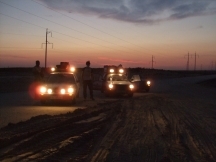 Each team on the Mongol Rally has to raise 1000£ for charity. 60% of that money goes to the Mercy Corps Mongolia and the rest goes to one of five other official charities. We have chosen the Christina Noble Children's Foundation. 1000£ is the mininum, though we're obviously hoping to raise a little more than that. In other words, it's time to open your wallets. If you know us, now is your chance to prove how much our friendship is worth to you. In cold hard cash. If you don't know us, this is an excellent opportunity to make new friends. The more you give, the better friends we'll be. Seriously, even if you're kind of broke right now, donate at least a little bit to show your support. To the right you will find two donation buttons, one for each charity. We are required to make the donations through justgiving.com, but you are not. If for some reason those buttons don't work for you, you can simply contact us and we will find a way to take that money of your hands in the most convenient way possible. Everyone who gives will get a postcard from an exotic location in Central Asia (if we make it that far) and we're also working on additional cool stuff for donors. If you want the postcard and the other cool stuff, don't forget to contact us after donating. Justgiving does not give us your e-mail address, so we have no way of contacting you. So, ich fürchte jetzt wird es Zeit, euch um Geld zu bitten. Keine Panik, es ist nicht für uns, sondern für einen guten Zweck. 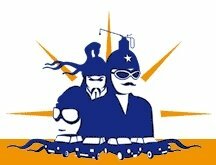 Jedes Team das an der Mongol Rally teilnimmt muss 1000 Pfund für einen guten Zweck sammlen. 60% des Geldes geht an das Mercy Corps Mongolia, die anderen 40% gehen an eine von fünf anderen offiziellen Wohltätigkeitsorganisationen. Wir haben uns für die Christina Noble Children's Foundation entschieden. Mit anderen Worten: Zeit die Geldbörse zu zücken. Wenn wir euch kennen, dann habt ihr jetzt die einmalige Chance zu zeigen, was euch unsere Freundschaft wert ist. Und zwar mit Bargeld. Falls wir euch noch nicht kennen, dann gab es noch nie eine so günstige Gelegenheit neue Freunde zu gewinnen. Und zwar auch mit Bargeld. Je mehr ihr gebt, desto größer wird unsere Freundschaft werden. Ernsthaft, selbst wenn ihr gerade nicht so flüssig sein solltet, wäre es toll, wenn Ihr wenigstens ein kleines bisschen spendet, um eure Unterstützung zu zeigen. Rechts findet ihr zwei Buttons (für jede Organisation einen), mit denen ihr Geld spenden könnt. Wir müssen die justgiving.com-Seite verwenden, ihr allerdings nicht. Falls ihr mit der Seite nicht zurecht kommt, meldet euch einfach und wir finden dann einen Weg, um eurer Geld so bequem wie möglich von euch zum guten Zweck zu bekommen. Jeder der spendet, bekommt eine Postkarte aus einem exotischen Ort in Zentralasien (falls wir es bis dahin schaffen). Außerdem arbeiten wir noch an weiteren coolen Sachen für Spender. Wenn ihr die Postkarte und die anderen coolen Sachen haben wollt, dann vergesst nicht euch nach dem Spenden bei uns zu melden. Justgiving gibt uns keine Daten von euch, wir können euch also nicht kontaktieren.